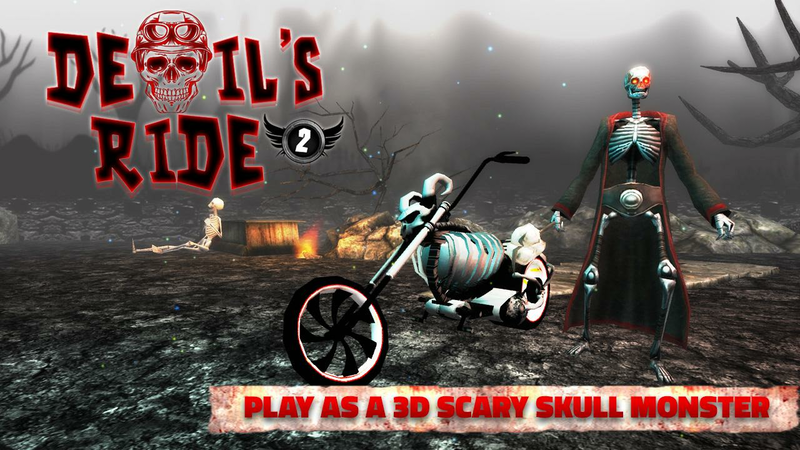 In Devil's Ride 2, explore the dark underworld Ghost Rider whereyou play as a 3D skeleton racer. Jump over the tracks with hugegaps, accelerate on top of the crazy ramps and paths filled withvarious obstacles like pounding hammers, swinging axes, spikes,fireballs that are out to attack you. Drive fast through amazingjumps and loops in this extreme racing game. Rush through themountains, tackle the danger and crush your enemies in Devil's Ride2. With 10 ghost ride upgrades and 15 scary levels, this trackracing game provides a complete 3D bike driving experience. Dynamicobstacles, cinematic camera changing and halloween theme comingsoon this game is sure to keep you addicted for hours. Show yourextreme skills as you negotiate the obstacle. Control your speedand crush the furious monster enemies to unlock the level.Responsive controls that will help you burn, smash, steer throughcrazy obstacles and take on a daring rider you simply wouldn'tbelieve! Devil's Ride 2 Game Features : - Original soundtracks andamazing background music. - Adventurous hurdles on the road. -Excellent level designs and background themes with different world.- Realistic 3D physics. - Unlock and upgrade speed bikes andmonster characters. - Upgrade your bike abilities to be the bestHow to Play: -Tap to race/speed your bike.